FSE Robline Pro Racing Sheet is ideal for a high performance control line for all Hobie, Nacra and Prindle boats. 7mm is slightly thinner, lighter and faster thru the blocks than the traditional 8m or 5/16″ sheet which makes it ideal as a jib sheet in light wind sailing. Also designed for use as a high performance control line for downhaul systems, outhauls, vangs, mast rotation and jib traveler control lines. FSE Robline Pro Racing Sheet is a solid braid racing sheet that was designed for speed and control in all conditions. It has high tech German Teufelberger Dyneema fiber and Technora fiber mix for minimal stretch and enhanced abrasion resistance. This technical mix of fibers provides a soft hand feel, great cleating ability and an incredibly long lifetime. Developed together with the cat sailors of the Flying Phantoms and the medal winners at the Rio Olympics. Robline Pro Racing Sheet is incredibly light and flexible to quickly run through blocks even in light winds. Robline Pro Racing Sheet is an easy to splice solid braid. Great for use in tapered sheet systems. 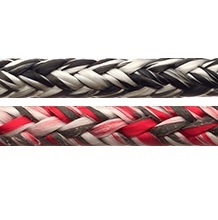 3 to 4mm dyneema can be inserted as a core in cleating and handling sections if a thicker diameter is desired. Due to the Technora fiber in Racing PRO you cannot cut line with a hot knife as the Technora does not melt. Best to cut rope first and then seal end with hot knife. It’s also practical to bury the end of the line back into itself, use small fid or D-splicer to pull bitter end of line back into center of rope.If you plan to splice the end we recommend getting an extra foot of line per splice. Step 1: Tape end of line with 3M Electrical Marine tape.